More often than not, our meals are only planned a few days in advance, a week at the most (loosely gathered in my head while grocery shopping); typically, the night before. 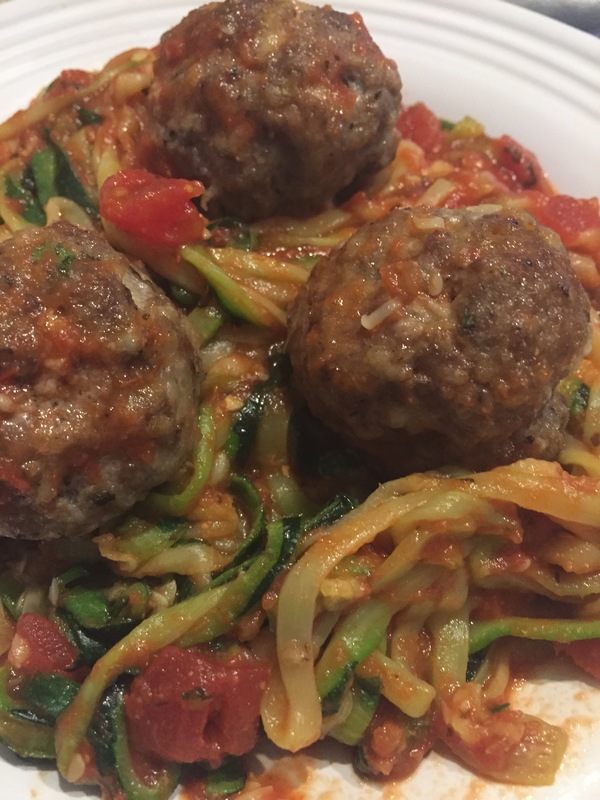 I’ve heard about “zoodles” for a while now and when we were tossing around ideas the night before last, and we settled on spaghetti & meatballs, I figured I’d try my hand at zoodles as I’d recently ordered and received my zoodle maker. The family didn’t let me get very far before they insisted I still make spaghetti noodles. The interesting thing about zoodles is that there really isn’t a recipe. I’d done my due diligence and reviewed some instructional tips beforehand. One that I came across indicated that once you had the zoodles, to place them in a colander, toss them with 3 tablespoons of Kosher salt and allow them to sit for 20 minutes before rinsing with water really well to rid the salt. The idea behind it was to somewhat dehydrate the zucchini as it’s naturally wet, it helps maintain the moistness in breads, cakes, etc. This made sense to me. Until I made them last night. Dehydrate and then rinse like mad all the salt out of it, essentially reintroducing all the moisture, but then lay the zoodles on paper towels to soak up and pat out the extra moisture. The next step was to heat a skillet to medium high heat, add just a tsp. of olive oil (to prevent them from sticking to the pan) and sauté for 4 minutes tops. With my homemade meatballs fresh out of the oven, the spaghetti noodles and my zoodles ready to go, I dished out the meal. It was all good until I bit into my zoodles and quickly discovered that even with as much rinsing as I’d done, these were SALTY! What a disappointment! For next time, NOTE TO SELF: just create the zoodles, blot with paper towels to absorb the zucchinis natural water content, and then sauté for 4 minutes.